I have only recently caught up with last month's Channel 4 documentary charting the "mad love" between gentleman barrister Arthur Munby and toiling maid of all work Hannah Cullwick in Victorian London. 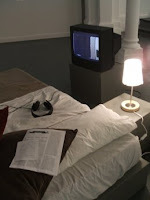 The subject matter of Upstairs Downstairs Love also formed the basis of the Normal Love exhibit I saw in Berlin in 2007 at the Kunstlerhaus Bethanien. Hannah Cullwick is a fascinating figure, a working class woman who kept a diary and pursued a class-defying relationship which encompassed S/M role-playing, cross-dressing and muscle fetishism. While the doc took a curiously judgemental tone, decrying the relationship as shocking and bizarre, Normal Love instead depicted it as an admirable bit of transgression by Cullwick. Refusing to be constrained by notions of gender, class or race (she dabbled in some questionable blacking up), she revelled in her physical toil and embraced her identity as a maid of all work, building up musculature and strength which delighted Munby. Unusual in his admiration of working-class women, Munby photographed female miners in Lancashire and took samples of their calluses. He also carried with him a photo of Cullwick's hands. Both documented their relationship, though it remained secret from their peers and Cullwick even took the bold step of changing jobs when staff became suspicious of the chain she wore round her neck as a symbol of her "belonging" to Munby. In her diaries she records submissive acts such as washing his feet and licking his boots. However, as the doc makes clear, Cullwick was probably in the driving seat in the relationship and refused his attempts to turn her into a lady. While Munby's diaries are full of his admiration for her physicality and muscularity, it is less clear what drew her to him, and indeed kept them locked together for decades in a relationship she described as "the same to us as marriage is to other folks", much of it spent living apart. Cullwick was a new and intriguing figure to me, though her diaries have been published and analysed in detail. Extracts from the diaries and photos of her appeared in Normal Love, alongside works by modern artists such as Del La Grace Volcano, Karin Michalski and Pauline Boudry, creating intriguing juxtapositions. The theme of the exhibit was sexual labour, a longtime interest of curator Renate Lorenz. When I spoke to her last year in Berlin, Lorenz explained to me what led her to put Cullwick at the heart of the exhibit. "I found the material very interesting to talk about connections.... Her field of work was also the field where she enacted her sexuality together with a bourgeois man, so their S/M scenario was exactly her wage labour. "They used her wage labour as a scenario which they enacted [as] their private field and she also wrote to him about her wage labour in detail and so on. So there were interesting things taking place." Ironically, marriage and Munby's desire for a conventional wife seem to have been the undoing of the union. The thing that drew them together--her work as a maid doing dirty, physical, hard labour--seems to have been exactly the thing he wanted her to change in order to be his wife. Quite the U-turn. For Lorenz, the Normal Love exhibit connects the fields of labour and sexuality: "to question what it means for the field of labour, how it is an issue of power". Scenes from Cullwick's relationship with Munby were re-staged in Normal Work, a film by Renate Lorenz and Pauline Boudry starring drag artist Werner Hirsch as Cullwick being directed by an off-screen voice. Hirsch moves in to the poses, include slave and gentleman, while positioned in front of two distinct backdrops, a flowery, Victorian-era one and a photo of S/M dykes by Volcano. Boudry explained these represented Cullwick's era and modern times. "The idea was to reflect on these two moments: her moment of her life and look from our perspective now--what we know of drag performances, etc.--at her pictures... and the opposite, as well; from her perspective, try and look at what is drag performance now and include more of this question of work, of economy, of capitalism." Giving Hirsch instructions as to how to hold the poses, she said, is a reference to Cullwick's dynamic with Munby. "It's about the relationship between the person in front of and behind the camera.... and to make visible the desire between these two." I was curious as to the connection between this artistic work with the more prosaic daily bread version. Boudry said being able to negotiate social boundaries and pass is quite relevant to modern times, as workers are called upon to be flexible and adapt to different situations. "This crossing of social positions that she was doing at the time, which means being able to be a hardworking maid of all work who can also pass as a lady sometimes, who can also pass as a man of the bourgeoisie or who can pass as a slave, is something that gave her more recognition," she said. "I think this being able to cross positions is something now that is very much demanded in contemporary work situations."